In this sector of South East London, there is an increasing number of children needing additional support with literacy and numeracy. At this very young age, it is has become crucial to have the right educational foundation for later life development. The school wanted help maximising the few hours of play-based learning time they have with the children. In addition, it was equally crucial to include the wider family in learning development of the children. 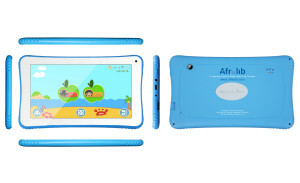 Afrelib supplied the nursery with customised tablets for the children pre-populated with apps to meet the aims of the nursery. These are: Inspire children to learn; Learning through play; and Dynamic classrooms.These aims helped us to prioritise apps for reading, writing and curiosity. Strongly guided by the Early Years (under 5s) Foundation Framework (EYFS), Afrelib carries out continuous updates of the content of the tablet together with school staff. Crucially and an important aspect of the EYFS is assessment. This assessment is important in keeping parents, carers and child development practitioners informed of children’s progress, understanding their needs and ability to plan activities and support. Getting this done efficiently and properly can be challenging. We assisted teachers with the right apps and device to get this done successfully.